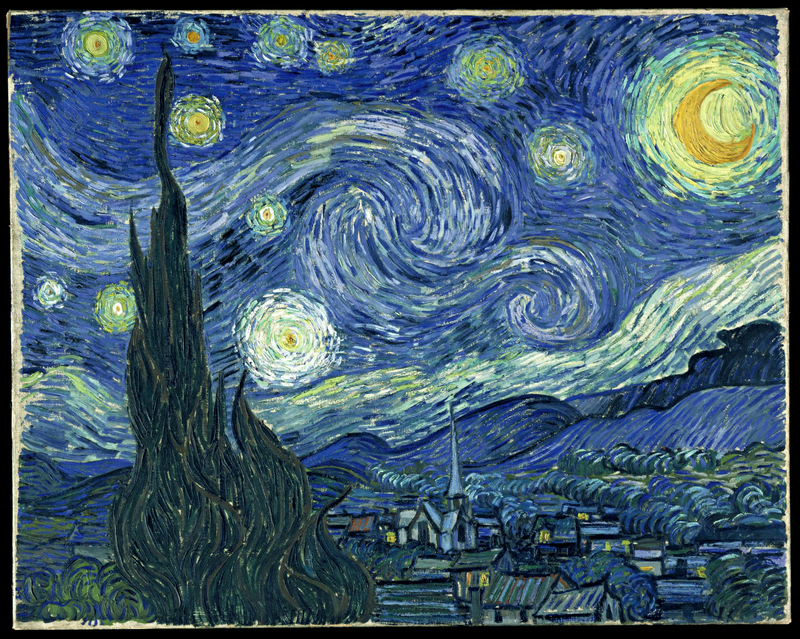 For starters, this was supposed to be finished yesterday, when it was still Vincent Van Gogh’s birthday. It is a whole lot of thoughts mulling around about being an artist, and what it means to feed that. The other morning, on my first morning of not getting ready for work in an office, I found myself sitting and staring out the window at the front pasture, and the mountains on that side of the house, the sun rising, the colors of pink morning filtered through fog. And I realized I hadn’t sat and stared for a really long time. There is always something to do, and somewhere to be, a list of things to accomplish. As an artist, sitting and staring is often a huge part of our job, a huge component of the act of creating is doing nothing and being well within the moments between things. Those moments are huge. Those places between anything happening is where the artist folds herself into the great silence of molecules and rendering, sparks of genius, divine unfolding. I heard Natalie Goldberg being interviewed on NPR yesterday on my way to the grocery store. I had tears in my eyes almost the whole time. She is so tremendous, and such an inspiration to a generation or two or three of artists. She has been doing retreats in Taos, New Mexico for some time now, in addition to her other creative work, and she was talking about how most of the time she has people being silent. There is work to be done, and directed time, but it is done in silence. She said that at the end, when people are allowed to talk, they often don’t know what to do with themselves, they have been involved in one another’s creativity in another plane, in a whole other dimension, through silence, and speaking almost seems insincere all of a sudden. Trying to put words to the depth of emotion and the shared experience is difficult. In hearing her talk, I was blasted into my past where I felt alone and lonely writing. So much of my world happened alone with me and a pen and paper. Whole universes were opening up to me, and then I would try to read to someone, or share where I’d been, and they weren’t there with me, they were impatiently waiting for me to finish, so we could talk and really communicate. All I wanted to do was bring them to where I was on the page. It is true that art is a lonely endeavor, writing, perhaps poetry lonelier still, for lack of audience, but in hearing Natalie speak about her silent retreats, I all of a sudden realized that all this time I haven’t been lonely. Isn’t that the craziest thing, to suddenly realize at the age of 46, that all this time I haven’t been lonely? I think our world and society wants us to believe that the quiet times, the silent moments, the alone times are supposed to be felt as lonely. I have little children who are a constant source of joy and a non-ending source of continual banter about virtually nothing, yet always something tremendous to them – have you heard of this – the non-stop chatter of a five year old? As I have gotten older, I seek out spaces of quiet, early mornings, trips to the grocery store alone, where I can just Be in the Quiet, sunk into a deep place of nothing, where thoughts meander and make no sense, and then make sense, and play, and catch, and skip. Sometimes in the moments between anything, is where I feel the most love for my family, it’s where a word or a phrase will repeat in my brain tenderly, something they said that I want to hold onto, that I want to etch into my subconscious. In the spaces between all the happenings of my life, in the moments where I hear my own breath and the deep inhalation of all that I love around me, my children, my husband, our animals and the view from here, I tuck myself into those folds of time, those tiny portions of quiet that touch the hem of the garment of eternity. The internet has become the new Artist Salon. I love that I can put my thoughts on paper here, and let friends wander over to see what I’ve been thinking. There are people I have never met in person, but we share a space between my heart and yours, between my home and yours, our space here in the ether in the never-land of space and time between my desk and your kitchen table. Here, in this place, we meet and talk of what is on our hearts, and how we will go about creating today. It is a great joy to see that I have not really been lonely at all, really ever. I have always had pen and paper and vast worlds to explore, and I have always delighted in them. It becomes a craving to carve out a little time to sit and stare, to watch the world go by and daydream about what it all means. Next Post Come here, You! And, my dear, you’ve always been listened to . . . even during some of those times when what you had to say – I didn’t need to hear, but, because you’re loved, I listened. And, listening, I learned and loved you more. It is true! There has been a lot of listening and lots of love in my life. I may not have conveyed the right sort of longing to communicate. You always listened, and heard me. It is not really possible for someone to float with me among the clouds of unknowing as the words pour onto the page. Perhaps that is where the inherent loneliness of writing comes in. It is something that must be done alone (for the most part).